Dil Toh Baccha Hai Ji is an upcoming Hindi romantic comedy film, directed by Madhur Bhandarkar, starring Ajay Devgn, Emraan Hashmi, Omi Vaidya, Shazahn Padamsee, Shruti Haasan and Shraddha Das in the lead roles. The film is produced by Madhur Bhandarkar and Kumar Mangat under the banner of Bhandarkar Entertainment and Wide Frame Films. The film is set to release on January 28, 2011. 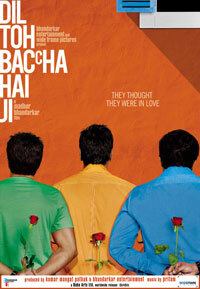 The film score and soundtrack for DTBHJ is composed by Pritam Chakraborty. You can watch the trailer of the movie below. 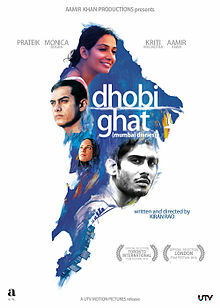 Dhobi Ghat is a Hindi film produced and directed by Kiran Rao in her directorial debut. The film is scheduled for release in cinemas on 21 January 2011. The film stars Aamir Khan and Prateek Babbar and is produced under the banner of Aamir Khan Productions. Aamir Khan plays one of the lead role in the movie as a painter. Gustavo Santaolalla was signed it to compose the score and soundtrack of the film. 'Dhobi Ghat' movie is shot entirely in Mumbai during Monsoon season on real locations of Mumbai city. The movie stars four characters in lead role. Aamir Khan(Arun) plays role of seclusive modern art painter. Monica Dogra(Shai) as Indian American banker who is on visit to Mumbai. Prateek Babbar(Munna) as washerboy. Kriti Malhotra(Yasmin). The movie is about these four characters from different class of society and how the lives of four characters are interwined. The film was shot in Mumbai using "guerilla" techniques. Due to the 2008 Mumbai attacks, shooting was delayed when, citing safety concerns, the government denied Rao permission to shoot scenes at a railway station. According to Director of movie, Mumbai is the Fifth Character in Dhobi Ghat. The movie was shot at skycrapers under construction, Mohammed Ali markets, sea facing bunglow at Worli, Dhobi Ghat at Mahalaxmi, Chawpatty(beach) and Marine Drive. No special sets were constructed to shoot the movie. Dhobi Ghat movie budget was 5 crore rupees. The movie will be released in 2 versions. Original version has around 40% dialogues in english. Second version has all the dialogues dubbed in hindi. 7 Khoon Maaf is an upcoming Hindi drama, thriller and black comedy film directed by Vishal Bhardwaj, starring Priyanka Chopra in the lead role. The film, based on the Ruskin Bond short story, Susanna's Seven Husbands, features seven male leads with Naseeruddin Shah, John Abraham and Neil Nitin Mukesh as the youngest husband, as well as Irrfan Khan, Annu Kapoor, Naseeruddin Shah's youngest son Vivaan Shah and Russian actor Aleksandr Dyachenko, in the roles of the seven husbands. Priyanka Chopra will be seen playing a negative character once again after Aitraaz (2004) and Yakeen (2005). 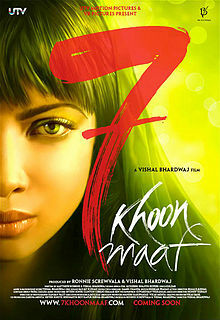 7 Khoon Maaf was first scheduled for release on 21 January 2011, but has now been postponed to 18 February 2011. In this film, Priyanka Chopra's character ages from 20-65 and will be seen going through seven different age makeovers as wife of seven different aged men at different stages of her life, for which prosthetics had to play a heavy part. And for that, director Vishal Bhardwaj has hired renowned Academy Award winning, Hollywood special make-up effects artist, Greg Cannom of The Curious Case of Benjamin Button (2008), to create those seven different looks for Priyanka's role in the film. Yamla Pagla Deewana is an upcoming comedy-drama film directed by Samir Karnik, starring Dharmendra, Sunny Deol, and Bobby Deol in the lead roles. The film is produced by Samir Karnik and Nitin Manmohan under the banner of Top Angle Productions. The whole Deol family is coming together after their last sports hit, Apne (2007). The film's title is inspired from the song "Main Jat Yamla Pagla Deewana" from the 1975 film, Pratiggya also starring Dharmendra. The film is scheduled for release on January 14, 2011. The theatrical trailer was released on 5 November 2010. The filming started in February 2010. Director Samir Karnik along with the lead cast of Dharmendra and Sunny Deol started shooting in Varanasi in April 2010. The shooting was disrupted twice, first in March, due to the hospitalization of Dharmendra, and then in July, when Sunny Deol faced back problems while filming an action sequence. The music of the film is composed by Pyarelal, RDB, Nouman Javaid, Anu Malik, Sandesh Shandilya, Rahul Seth, and Sanjoy Chowdhary. The lyrics are penned by Anand Bakshi, RDB, Rahul Seth, Nouman Javaid, Anu Malik, Irshad Kamil, Dharmendra and Shri Guru Granth Sahib.